(PHOTO) The 19-year-old at the hearing against him this Thursday in Israel. 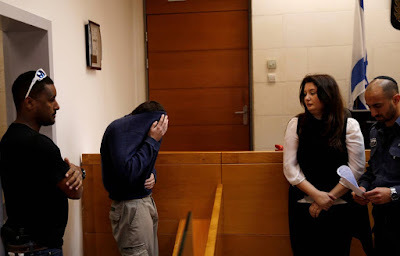 Israeli police have arrested a 19-year-old boy suspected of making false bomb threats against dozens of Jewish centers in the United States, but also in Australia and New Zealand. The boy is Jewish and has US and Israeli citizenship, a police spokesman said, adding that it is not clear what his motivation was. The US has suffered a wave of more than 100 threats against Jewish organizations in dozens of states this year. The detainee has not been identified and has only been detailed that resides in the south of the country, according to the agency France Presse. The agents have searched his home on Thursday and have determined that three months ago he began to make the threats, using technologies that hide the origin of the calls. "We believe he is responsible for the wave of calls, bomb threats, made against Jewish community centers in the United States," a police spokesman told Reuters. The FBI has confirmed in a statement that it collaborated with the Israeli police in the investigation, which began at the same time in countries where anti-Semitic threats were being recorded. "The arrest in Israel today marks the culmination of a large-scale investigation across continents of hate crimes against Jewish communities in our country," said US Attorney General Jeff Sessions. In the United States, on March 3, an experienced journalist accused of using e-mail accounts had been detained in San Luis, where he sent his ex-girlfriend to send threats in writing. The authorities considered, however, that it was only responsible for part of the threats. In addition to false bomb warnings, there have also been acts of vandalism against Jewish cemeteries in New York, Pennsylvania and Missouri.